In the left-hand navigation panel, click Groups. Type a name for your new group into Group Name. Group name cannot be changed after the group is created. In Bamboo, a group name can only contain characters from the following set: a-z, @, . , _ , - , 0-9. You can't create groups that contain invalid character. Similarly, if you try to import of groups that contain invalid characters from an external source, the import of that group will fail. From the Users to add list, select your users. Hold <Ctrl> to select multiple users. 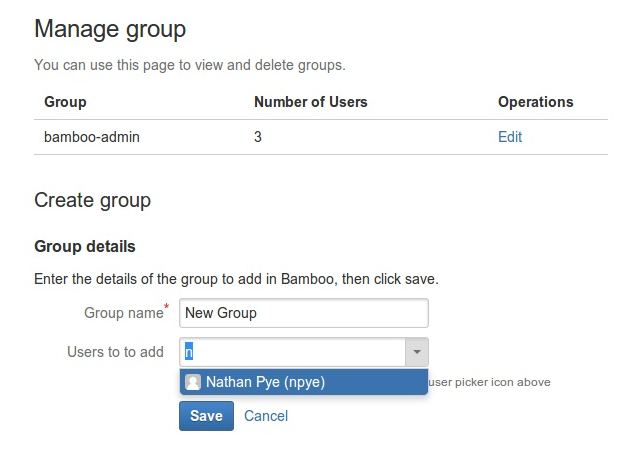 You can also add or remove users from the group later if required.